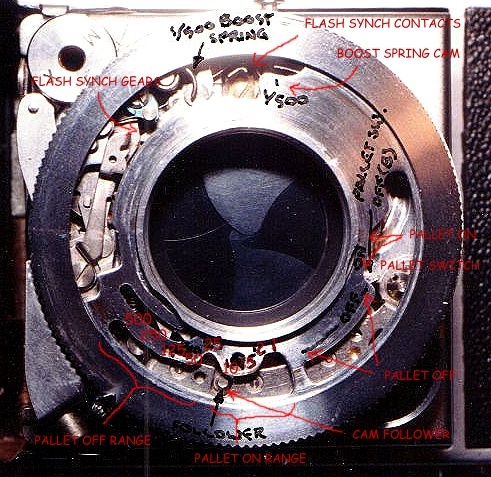 About 20 years ago I wrote a series of articles on the workings of different cameras. They're pretty basic, but they give the general idea. My apologies for the appearance of these articles: they're scans of photocopies of hand-typed pages. Here's a photo of a Synchro Compur shutter (in a Retina IIa), to illuistrate how the different speeds are controlled. The chrome ring around the edge carries 3 contoured slots. I've marked the speeds around the cam slot at the bottom .... the shutter is set at 1/10 second here. As the ring rotates counterclockwise, the cam follower goes to the higher speed positions. You can see that the cam is shaped to allow the follower to move toward the lens as slower speeds are selected, from 1/500 to 1/25; then, at 1/10, it goes back out to about where it was at the 1/100 setting. The difference is that, in the slot at the lower right, a second cam has now turned on the pallet switch, engaging the pallet and making the delay gears run about 10 times slower than they do with the pallet disengaged. From 1/10 to 1 second, the speed cam follows roughly the same pattern it did from 1/500 to 1/25, but now with the pallet engaged the speeds are proportionately slower. At the fast end, at 1/250 the shutter is running essentially at full speed with no delay. The difference between 1/250 and 1/500 comes when the ring is turned fully counterclockwise and a step at the right hand end of the third slot, up on top, engages the 1/500 booster spring and pushes its little tail toward the left. This speeds up the blades, changing the 1/250 second maximum speed to 1/500. There are a number of differences in details of construction among leaf shutters, but all follow these general principles and use these basic mechanisms to control the speeds. A further discussion of the construction and operation of the Compur shutter can be found here.